Third-party manufacturers in China are still attempting to clone Apple's new Lightning cable, but supplies are unlikely to hit before Christmas, according to reports. The new reversible syncing and charging solution for the iPhone 5, iPod touch, and iPod nano has replaced the tried and tested 30-pin cable used with legacy devices, such as the iPhone 4S. However, the 8-pin accessory now features an integrated chip, which it won't work without. This makes copying the connector and creating less expensive solutions more difficult. The true function of the chip is unknown, but it's thought that Apple may have introduced it simply to ensure outside companies will need to enter into official licensing agreements order to manufacturer accessories. AppleInsider found that Chinese companies are still offering delivery of cloned Lightning cables within 30 days, but that deadline is said to be unrealistic. One U.S. cable supplier, Double Helix Cables, contacted a supplier in China, which told the stateside company that work won't start on unravelling the mysterious chip until after a Chinese national holiday is observed this weekend. That, according to Peter, owner of Double Helix, means it's unlikely any products will be ready to ship in the next two months, at least. 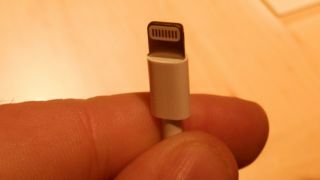 "People should be very surprised if this cable can be cloned by Christmas," Peter told AppleInsider. "This is a serious undertaking and the Chinese know it." Peter spoke with TechRadar earlier this week about the mysterious chip and asked that, for privacy reasons, his last name not be printed. Apple is currently charging £15 ($19.99) for new Lightning connectors. For those unconcerned with owning the official accessories, much cheaper, third-party solutions were always available on eBay or Amazon, but it looks like those will still be a while coming.